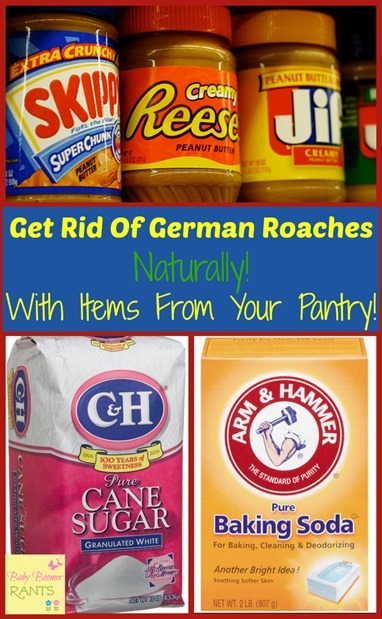 Get Rid Of German Roaches Naturally! You are here: Home / Family Living / Household Hacks / Get Rid Of German Roaches Naturally! I thought I would share a frugal and safe, natural home remedy for getting rid of German Roaches. No one wants roaches, no one wants to say they have roaches. But, from time to time we may have to deal with this issue. A few years back we had a MAJOR infestation of German Roaches for a few years. First of all, we had no idea where they came from and they spread so quickly. We had a regular exterminator that came out on scheduled visits, so I was surprised to see anything. He asked me if there was anything new in the house, I said no, and then I remembered a family member had asked us to store a stove for them in our garage. Well, there was the culprit. He told us that German roaches in particular like the taste of electricity – it tastes sweet. So, that’s why you see them in electronic stores and pawn shops, according to him. Well, I paid him a lot of money and he was never able to get rid of them, I paid another exterminator even more money to get rid of them. Nothing worked, I paid a lot of money for bombs and set them off repeatedly in every part of the house including the attic – nothing worked! I even searched the local flea market for some sort of chalk that was supposed to kill them when they crossed it, I marked up everything in the house, but it didn’t work either. We moved and they followed… It was terrible. So, one day I happened upon a “recipe” that promised to rid us of them, so I thought why not – I have tried everything! So, I mixed up Peanut Butter, Sugar, and Baking Soda in a large bowl – cause I needed a lot! I the placed a teaspoon in several plastic baggies and placed them opened in drawers and cabinets all over the house. In less than 1 week they were gone! I mean not a one! I left the big bowl full of the leftover concoction out overnight, too. I was shocked to say the least! We had spent over a thousand dollars and more than a year battling these things and all the while the answer was in my pantry! From my understanding the peanut butter and sugar draw them and the baking soda kills them. You can make the same mixture with honey instead of sugar and with boric acid instead of baking soda, if you like. The Dollar Stores sell a large bottle of powdered Boric Acid for just $1. I use that outside around doors and windows to keep them out. I hope it works as well for you as it did for us. Let us know! This sounds so wonderful! Those creatures are awful! Do the measurement of the ingredients matter? What consistency are we looking for? I just made it into a paste. I didn’t want it runny or anything like that. Could you also use Borax. In place of Boric acid? It sounds like it might work, but, I haven’t tried it! If you do, please let us know if it works! Yes we had a million German Roaches and it worked right away and it was great! Do you know where their home is? Like the place they are coming from? We had a shower insert in the upstairs bathroom right above the kitchen and they were coming from there – so I made sure I put Boric Acid behind there, too. I really hope this works! Do they die in the mixture or just eat some and leave? How much baking soda is enough? Like a whole box? It worked for m 4 years ago and they have never returned! They eat the mixture and go away and die. 1 cup of baking soda. I added the recipe to the post, I don’t know why I forgot! I dont think it is working. I put a bag in every cabinet and even one in the bottom of my trashcan but they are still everywhere. I also left the bowl out on the counter like you said. Its been a week. They are driving me crazy! Are the baggies left open so they can get in? Have you seen any IN the bags or the bowl? Did you try it with the Boric Acid? You can get a large bottle of the powder at the Dollar Store for $1. Let me know – I know how annoying they can be! I am going to try this tonight. Has anyone else tried this and had good results? Before I spend money on having the house exterminated I thought I might give this a try. I spent thousands on exterminators and they couldn’t get rid of them it was nuts! Boric Acid – which sounds awful, but is powdered and you can get a huge plastic bottle of it for $1 at the dollar store works great too. It’s a white powder and you can sprinkle it outside around doors and windows. Also if you have a shower insert, they like to breed behind that – you can find a spot and squeeze the powder into it and it will kill them. You read my mind, Dian – that’s on the agenda for today! Already squirted the boric acid in there a while back. But, today, it gets caulked up as well. That’s so great! So glad to hear it! I know how awful it can be! We moved from apartment to house because of our roach problem the landlord was refusing to do anything about it. At first we thought they were gone but after being here for a few months the infestation has gotten way worse. I’m trying this hoping it works because we have 3 small children and can’t stand living with these things. Is there any reason why our bathroom seems to be the worse? How long until we see results? I can tell you they love electricity according to the exterminator, so they like to chew on electrical wires cause they taste sweet (weird, huh?). One day I saw one in the upstairs bathroom and lost it! Until then I had been able to confine them to the downstairs. That bathroom had an “insert” a plastic one piece bath/shower that they “insert” when building a bathroom and I found they were infested behind it. I bought a bottle of Boric Acid – which is white powder at the Dollar store for $1 and poured it down behind that insert and then caulked any cracks. Then I did the above recipe and I would say we saw immediate results and were free of them in about a week, maybe. We moved 3 times and they went with us, so I know the feeling. it’s because they are in the wires of the fridge and microwave and tv’s and computers and so forth. They told me that’s why you see them in pawn shops and electronic shops because of the electricity. They are incredibly annoying and I SOOO know how you feel! I am so happy to hear that! It is a most annoying and depressing thing to have happen and never be able to get past! It feels like it will never end, so I totally understand your excitement! Do you think the peanut butter makes a huge difference? We don’t have them inside so far as I can tell, but I occasionally see them outside of the house crawling on the walls. We are having an outside party in a couple of weeks and I want to get rid of them and ants by then. i just want to sprinkle it around the house and I hoping the sugar and baking soda will do the trick. I don’t, I think it is an easier concoction for in house use in the plastic bags. It holds together better and isn’t a squishy mess. But, anything that draws them and makes them eat it should work. Does it have to be in baggies? can i put it in small bowls around the house? I just moved into a place that they said they treated for the bugs but they are coming from everywhere. Nope, Kimberly it should work on paper plates or in bowls in dark places or places where you have seen them. In our house We have a HUGE roach problem too. We can see them in the kitchen and bathroom during all the day. Cooking has been something something very hard to do cause they smell the food and just take the opportunity to eat something. We cannot invite people over because of those discusting bugs. The smell in the Kitchen os awfull because of them! We’re druving crazy and cannot use strong chemicals because of our little puppy. Thank you SOOOO much for this tip. Will try it out today. Hope it helps! Will let you know. Good luck – this works well with German roaches, not sure about others. I wish you well – I know how it feels! oh my, i am at the point where anything is worth a try. does it have to be pure boric acid. what i have was supposed to be a boric acid poison/bait something or other or should i just go with baking soda? You can try either or both, but the big bottles of Boric Acid are just $1 at my dollar stores, so you might just want to do that. I keep a bottle and sprinkle it outside doors and windows at different times of the year to keep them out. i read this and immediately went and made some, i hope this works for us. We NEVER had roaches until my mother who decided she wold rather be homeless and do drugs than take care of herself, tried leaving some of her junk here and i was gone when she left it by my back door and i guess i got it out to late. We’ve had as huge problem since then and have been battling them ever since and this was 3 years ago. Hundred and hundreds spent in poison to get rid of them and nothing seems to work well, they always come back and stronger and the summer this year was so bad all bugs were way worse. we have an ant problem in the summer too but that easily fixed with borax sugar and water. I made mine a tad bit on the “dry” side and rolled it into balls to stash everywhere. I love this knowing it wont hurt my family if they accidentally get some on them. will report back how it goes. I feel your pain – I tried everything – I hope it works for you! We lived in a roach infested apartment for 4 years… it was AWFUL and moved to a better place…. took all precautions (bagged up the tv etc for a few weeks. didn’t use cardboard boxes etc) and we ended up moving into a roach filled apartment! We will be doing this tonight! I am so sorry to hear that, I know how frustrating it can be! IT WORKED! we put it out Thrusday went away for the weekend and I have not seen one! I didn’t even close my eyes when I turned on the kitchen light this morning! (to let them hide haha) THANK YOU!!!!!!! That’s great! I remember being afraid to turn on the light at night when we had come home! I know the feeling! So glad to hear it worked – I know how it makes you feel when you can conquer them!! Way back when, when I lived in Africa, my European parents had the most natural means to eliminate roaches from the house: they sprayed catnip infusion alongside the outside walls and the doorways and windows. Roaches never never entered the house. Years later, when living in Venezuela, I used the same recipe. It worked just as well. I brought the catnip in my suitcase, made a infused a quart of it and put it in a plastic spray bottle. That one enough to go around the house, the doors and the windows and the weeks I spent there where completely roach free. Wow! That’s one I have never heard! Thanks for the tip! I will try this I’ve i scene a few lately and read how fast they produce. I do have a quick question did you just you the snack size ziploc bags? Or could you post a pic of the final product (the bowl w/paste & ziploc showing the consistency and amount) thanks for your help! I’m going to try this! We had them really bad in our old (horrible, disgusting) apartment and some of them came with when we moved. They’ve slowly died off some but I’m ready to be rid of them! I’ll let you know if I see any improvement! Thanks! Mine were mainly in the kitchen and they had stared moving upstairs to a bathroom. That bathroom had a bathtub insert, I found a crack between the wall and the insert on the top corner and I squeezed the Boric Acid down in there, too. I think they were coming up from the kitchen which was directly below. I did mainly put it in the drawers and cabinets in the kitchen and even left it on the counter at night. I hope that helps – I do know how completely frustrating it is! Trust me! hello, I don’t have roaches but I do have a real big problem with little brown bugs. They seem to like rice,, flout, noodles,cake mixes, envelopes of spices and just hanging out on the counter. My mom used to say put bay leaves in the containers but that doesn’t seem to work much. Any thoughts on how to get rid of them? I think they are probably Weevils. You’ll need to empty the cabinets and clean the counters and cabinets in warm soapy water and then wipe them down with Oil of Eucalyptus or T-Tree oil to prevent them from coming back. They don’t like strong odors like that – that’s why putting the bay leaves in the flour normally works. I have also heard that placing small bags of black pepper around in the cabinets helps. Be sure to use glass, metal or hard plastic containers that are tightly sealed to store your rice, flour, sugar and anything else they might get in to. I don’t know if you still need help with these bugs, but i had them in all of my spices and they showing up flying around the kitchen area. I had to throw away everything in that cabinet and wipe down with bleach. The few that were still roaming the house took a while to get rid of. I am trying this tonight. Have a lot in my kitchen and they are starting to spread all over the house. I will let you know in a week. I hope it works. Good luck – they do spread like wildfire! Try sticks of spearmint gum in the flour for weevils. Did you take the baggie mixture out of the drawers and cabinets everyday and make a new one or left the first mixture for the entire time? I made it once,I never changed them out – there was no need. I made this into a think paste and it seems to dry and harden overnight. I add water to it everyday but i try not to make it too watery. Did anyone have this problem? I wouldn’t add water, I would add more honey or peanut butter. Your climate may be drier than mine. If you don’t mind it not being “All natural” you can use the boric acid. I hope that helps, I do understand how frustrating it is! Hi! Is this recipe safe for pets? I want to try this in my mother-in-laws house but she has cats. We have dogs and I used it with them, but I didn’t leave it where they could get to it. I just follow your directions, hope this works. I, like you, have spent lots of money trying to get rid of them. I am at a point that I dont want anyone to come over cause they are everywhere at all times. I totally understand! It was horrendous and I didn’t have anyone over, it’s so awful! Let me know how it works. Try Boric Acid – you can get a big bottle at the Dollar Store – around the outside and all doors and windows and maybe under, too. I can’t tell you enough how thankful I am to have came across your post. I have never in all my life had to deal with roaches! Actually I never seen one until I got out on my own. I had to look up roaches on the internet to be sure that was what I saw on my counter. With this being said a neighbor had moved out across the street from me about 3 weeks ago. For the last three days I have seen 2 roaches in my kitchen. At this point I am freaking out! So as many has posted on here, I don’t want the chemicals going through the house especially because my eldest son has asthma. I have everything in my pantry so I am going to put it out before they get any worse and over take my house. Thank you again for the information. I bookmarked your page and have used your recipe. I just feel the need to virtually “hug” you! It’s the first time we’ve seen a decline in kitchen roaches. We moved into a rental home last year…all is good except the fact that German roaches started showing up in the kitchen a few months down the road. We assume the rental company knew because we also found several roach motels while cleaning above the cupboards one day. I have been the equivalent of a modern day “Gestapo” when it comes to keeping the kitchen spotless on a daily basis to keep them at bay. We even leave both kitchen lights on through the night! So I finally have had enough and made your recipe. It has been such a great feeling to see the decline. I have only seen little babies here and there and even this morning I saw a dead adult. But I was used to seeing all ages throughout the day and especially at night so I know it’s working! Thank you SO much! What peace of mind I have finally! Having been right where you are – I TOTALLY get it! Turning the light on at night in the kitchen was a scary event! They like electricity! It tastes sweet to them, I have been told. That is why it is sooo hard to get rid of them. It’s not a dirty kitchen or house, it’s the electronics! I am so glad this worked for you, thank you for coming back and sharing – you made my day! Is it kill ant and roach too? I don’t know about ants. I didn’t have an ant problem. they like dark warm moist areas and wood and cardboard. I am going to try this today. Moved from a rental to my own place and thought I had gotten rid of them before I moved, no such luck! Thanks for your recipe, I’ll let you know how it is going. I’d love to hear – thanks and GOOD LUCK! I know what a pain they are! I hope it works domyou, please let us know! I hope that helps! Please let us know how it worked for you! I mixed this up yesterday and put them out. I haven’t seen any roaches but there are none in the bags either. Do they die in the bags or do they carry the stuff off and die somewhere else? Thank you! I’m praying they are off dying somewhere else! To tell you the truth, I put the baggies in in the drawers and cabinets and stuff, and I left the bowl full on the counter, too, in the kitchen because I was so over it. I did find a couple of them in the bowl the next morning, but, I never saw any in the baggies so I’m guessing that they took it away with them. I’m glad you aren’t seeing them and I am so excited for you! I totally get it! Thank you Dian! How long did you leave it out? I saw one tiny one yesterday afternoon and killed it. I still have it all out and wasn’t sure how long I should leave it? Honestly I left them in the drawers and cabinets for months. I wanted to make sure any eggs that were laid hatched, ate it, and died. And I wanted to make sure if any were next door (as we lived in a condo) they would not come back. I hope that helps and I am so excited it’s working for you! Great! I’ll do the same. Thank you again! I feel your pain! Please let us know how it works!